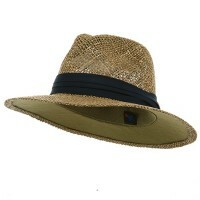 Safari hats, as the name implies, are originally worn for safari excursions in the African safari. Today, you can wear them even if you are not going to a safari adventure. They are also worn as outdoor hats for sun protection. The rush of boldness and courage felt by people who pursue adventures is one like no other. Because of this, it is important that our clothing meets the same standard of adventure that we feel. For most hats, this just is not possible, due to their casual nature. However, with Safari hats, it is almost impossible to not feel as if adventure ensues. These hats, unlike other Western & Dressy Hats feature a large brim that circles around the head, with an indented crown in the center of hat. They also sport a band around the crown in order to further set them apart from the majority of headwear. Safari hats are perfect for people who are not satisfied with everyday clothing, instead settling on something above the norm. These hats are the ideal hat to boost everyday life into more adventurous settings. For anyone looking for a little extra in their hats, Safari hats are a safe bet to own. Planning to go outdoors? Then safari hats will not only complete your look but it will also provide you with the right protection that you need. They are constructed from heavy-duty yet light materials for optimal comfort all throughout the day. Aside from being worn in plays and costumes, they are also worn as outdoor hats for sun protection. Similar with Cowboy Hats and Chinese Coolie Hats, safari hats are designed to provide optimum protection against different elements like heat, sun rays, and rain. Safari hats are also very fashionable. They can also be worn as part of your daily wear. You can collect them together with Fedora Hats, Derby Hats, and Gambler Hats as they can match different styles and designs of the clothes found in your wardrobe. Safari hats can be worn with formal and semi-formal clothes. But if you are looking for more elegant hats, you can try the structured Top Hats. While top hats are great for the gents, women can also wear Dressy Hats. They come in different styles and designs of dressy hats to choose from so opt for those that will match your outfit.